FEMA's Office of General Counsel "has advised that we do not do testing," because this "would imply FEMA's ownership of this issue," wrote a FEMA logistics specialist on June 16, 2006, three months after news reports surfaced about the possible effects of the invisible cancer-causing compound and one month after the agency was sued. Another FEMA attorney on June 15 advised, "[d]o not initiate any testing until we give the OK. . . . Once you get results and should they indicate some problem, the clock is running on our duty to respond to them." 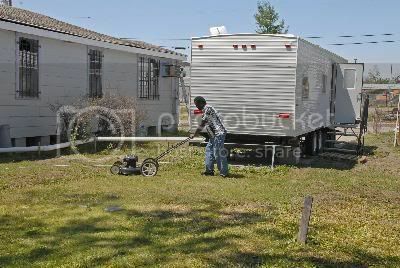 About 120,000 families displaced by Katrina lived in travel trailers and mobile homes after the storm, and about 75,000 still live in them today. In May 2006, the Sierra Club reported finding unsafe levels of formaldehyde in 30 out of 32 trailers it tested along the Gulf Coast. But as recently as this past May, FEMA Administrator R. David Paulison told another Congressional committee that he was unaware the trailers posed any health threat. Paulison was among those who testified at today's hearing. A chemical used in paint and adhesives, formaldehyde is classified as a "known carcinogen" by the International Agency for Research on Cancer. Yesterday FEMA announced that it has asked the federal Centers for Disease Control and Prevention in Atlanta to help in conducting a public health assessment of indoor air quality in its trailers. As we were moving into the trailer, we noticed that it has a very strong odor. We figured that is what a "new" trailer smelled like. Our whole family began to have sinus problems, our eyes would burn and water, and our throats were constantly sore. We seemed to catch every cold and virus going around, but we couldn't get rid of the illnesses. Three of our children began having severe nosebleeds, sometimes three or four times a week. I began having migraine headaches and pre-term labor. At the time, my doctor thought maybe my blood pressure was going up at home, causing the headaches. After three weeks of pre-term labor stopped by medication, my youngest son Michael was delivered four weeks early on January 17, 2006. Each of my previous pregnancies was either full term or past due. Michael was healthy and came home on time. Within a few days of being home, his sinuses were congested. I was so scared. None of my children even had a cold until they were much older than he was at the time. I kept thinking he is so small and too young to be sick. He never had a fever though, which suggested that his sinuses were just irritated. I was so worried that he would choke on the phlegm he was coughing up that I stayed up most nights watching him sleep. I came home one afternoon to find my daughter covering her nose; her hands, arms and shirt were covered in blood. The surprising part is that I did not feel the need to rush to her and find out what was wrong. I did not think for a second that it was anything more than a bloody nose. Two years ago, I would have panicked trying to get to her. Later that night, I cried for hours. How had we gotten to the point where I was not surprised to see my child covered in blood? It was almost like there were three disasters. There was a storm, there was the failure of the levees, and now there's been the government incompetence. ... We've got to fix this.